While the essentiality of water has never been in doubt, the awareness regarding the need to ensure safe drinking water is consumed has multiplied in the recent past on the back of growing penetration of social media. The trend among urban populations is to make water their favorite drink and bottled water offers the convenience as well as an assurance of purity. As per the findings of this business intelligence report on the global bottled water market, the demand will expand at a notable CAGR of 6.44% during the forecast period of 2017 to 2024. 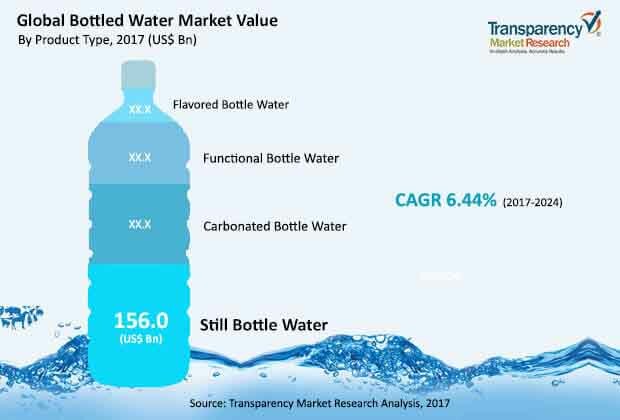 In terms of revenue, methodology-based market evaluations have confirmed that the global bottled water market will attain a valuation of US$307.2 billion by 2024, swelling up from its evaluated worth of US$198.5 billion as of 2017. Volume-wise, there will be an estimated demand of 528.2 billion liters of bottled water by the end of 2024. Apart from increasing awareness levels for greater intake of water among prosperous parts of the world, the bottled water market also stands to gain impetus from growing popularity of carbonated water. Companies operating in the bottled water market are coming up with ecofriendly packaging materials as well as providing for adequate recycling. Mushrooming of small and medium enterprises (SMEs) is also stoking the demand for large-sized bottled water. On the other hand, environmental impact of plastic bottles and stringent government regulations are a few restraints obstructing the bottled water market from attaining a stronger growth rate. On the basis of product type, the bottled water market has been segmented into still water, carbonated water, functional water, and flavored water. As of 2017, the still bottle water segment provided for a demand of 273.3 bn. liters in terms of volume, which represented a value of US$156.0 bn. Even throughout the aforementioned forecast period, this segment is expected to hold its prominence, providing for more than 77% of the overall demand in the global bottled water market. Among the other three segments, functional and flavored water are anticipated to gain moderate ground in the near future whereas carbonated bottle water will lose demand share. Based on packaging, the market for bottled water has been bifurcated into polyethylene terephthalate (PET) bottles, glass bottles, and others. Owing to consumer preference for purest form of water and the ease of handling, transportation, and storage – the demand for PET bottles is the strongest. By the end of 2024, the PET bottle segment is estimated to generate a revenue of US$209.1 bn. The analyst of the report has notified that there will be a demand for 409.7 bn. liters of water from this segment by the end of the forecast period. The report also gauges the potential of demand for bottled water that will be generated by the distribution channels of supermarket or hypermarket, convenience or drug stores, grocery stores or club stores, and others such as vending and food service. While the others distribution channels are providing for the most prominent chunk of demand, grocery stores and supermarkets are other two key categories that stay ahead in the near future. Geographically, Asia Pacific is foreseen to overtake the position of the leading regional market from North America by the end of 2024. As of 2017, North America constituted for a demand that was worth US$59.4 bn., slightly more than Asia Pacific at 54.3 bn. However, expanding at an above-average CAGR of 8.4%, the Asia Pacific bottled water market is estimated to be worth US$95.2 bn. The vastly populated region of Asia Pacific had two of the most promising emerging economies in China and India, whose urban populations are the key targets of the vendors operating in this market. Nestle Waters, PepsiCo Inc, Groupe Danone, The Coca Cola Company, and Mountain Valley Spring Company LLC are a few prominent companies currently ahead of the curve in the global bottled water market.